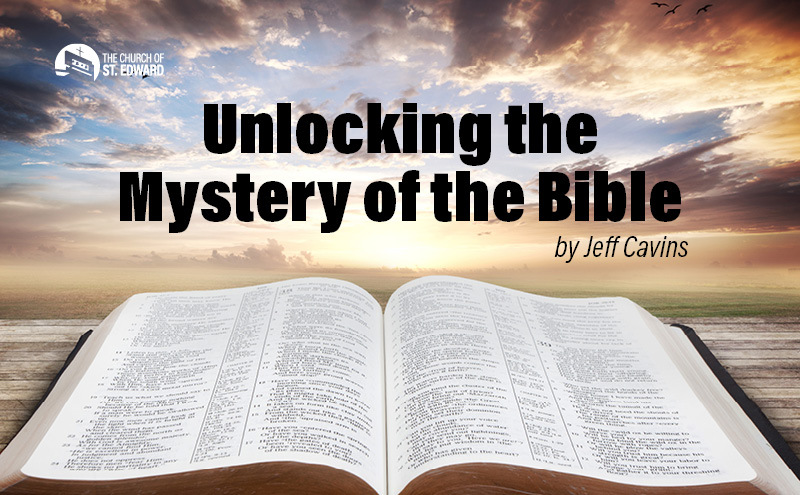 Unlocking the Mystery of the Bible! If you would like to have a deeper relationship with God and a better understanding of your faith, then join us for Unlocking the Mystery of the Bible. You will not only benefit personally from being part of this study; you will also help to bring about a profound renewal in our parish as we grow closer to Christ. St. Edward will begin Unlocking the Mystery of the Bible on Wednesday, February 20 at 6:30pm. Unlocking the Mystery of the Bible will help you uncover the story woven through Scripture with its clever narrative approach and ingenious color-coded Bible Timeline. It is a great way to get the “big picture” of the Bible and see how our Catholic Faith is rooted in Scripture. You’ll see how the Bible reveals God’s loving plan for your life, and you will learn helpful ways to put your faith into practice. The eight-week study includes a series of eight informative and engaging half-hour videos presented by Jeff Cavins. Each video will be followed by a lively group discussion in our parish Social Hall. You will receive a color-coded Bible Timeline Chart, a smaller bookmark version of the color-coded chart, and a Bible study workbook to help you navigate through the eight sessions. There is no cost, but a free-will offering will be taken. Registration is required. To sign up, contact Patrick Smalley at the parish office.